It doesn't matter how old or young you are. 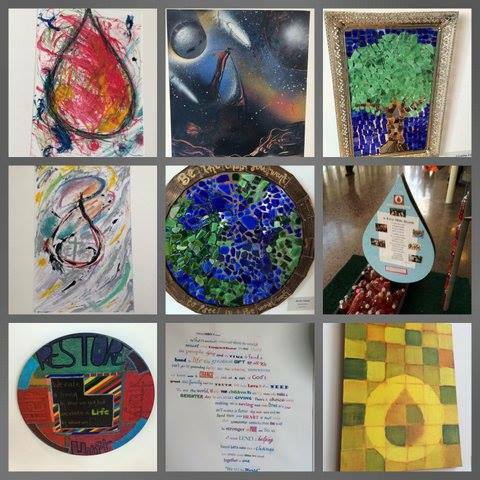 You can use your talents and skills to help end the HIV/AIDS and water crises. He's reflection from a high school senior who helped raise awareness for Blood:Water. On April 12, 2014, Reynoldsburg High School’s Encore Academy held an Art Expo. This was for the benefit of the charity group Blood:Water, which is dedicated to providing clean water and medicinal care for people with AIDS in Africa. The Expo included a gallery of artwork made by Encore seniors, a silent auction of the artwork, vocal and dance performances by Encore seniors, and a student-acted and directed performance of Neil Simon’s The Dinner Party. We raised over $3,000 for Blood:Water. That is what happened during the event. Now, here is some background about me. My name is Jacob DeBrock. I am an Encore senior that was part of the Capstone project that helped organize and run the Art Expo. For many people, this would be considered an event that would help one learn responsibility and empathy towards others. I did benefit from being a part of this experience. What I got out of participating in this experience, however, was different than what I expected. My contributions involved a lot of writing. My major contribution to the project was a narrative detailing what each group in Capstone did to contribute to the project. I also wrote a press release about the event that was distributed to media outlets in the nearby area. My favorite contribution to the event was a poem I wrote called “A Five-Mile Death,” which was displayed on a sculpture. I performed various errands for the head of the project, Mr. Underwood; this required me to develop communication and problem-solving skills that will be necessary in the future. The reason I did so much writing for my contributions is because that is both my hobby and part of my personal goals. In the future, I plan to be an English professor, which requires a lot of writing; it made sense to me that anything I wrote for this project could help me, if I needed to present anything I had written, and anyone else, if they were doing this event in the future. Capstone was one of two high school classes I took; the remaining were college classes at a different building than the one Encore was in. As such, I was not able to help as often as I would have liked with the project. However, what I learned from this experience changed how I view that I felt everyone else had. However, now, I see myself as someone who, even if my contributions are few, they can still make an impact on others. With B:W wanting to spread this program to other schools, my message is this: Even if you can contribute a little, bring everything you’ve got, because it’s worth it.